The Registrar’s Office in Welty Hall in room 105 will process paperwork for students who are eligible for veterans education benefits. 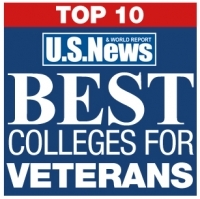 Go to VONAPP to apply for veterans education benefits. Veterans and dependents using the GI Bill education benefits will automatically receive early registration. If you are a veteran not using these benefits, then you will need to qualify with the MUW Veterans Certifying Office in the Registrar's Office to receive early registration for classes.